Lyrics don’t come much snappier than in classic football anthems. Even Tim Rice might struggle to coin as catchy a phrase as “Meat pie, sausage roll/ Come on Oldham, give us a goal”. 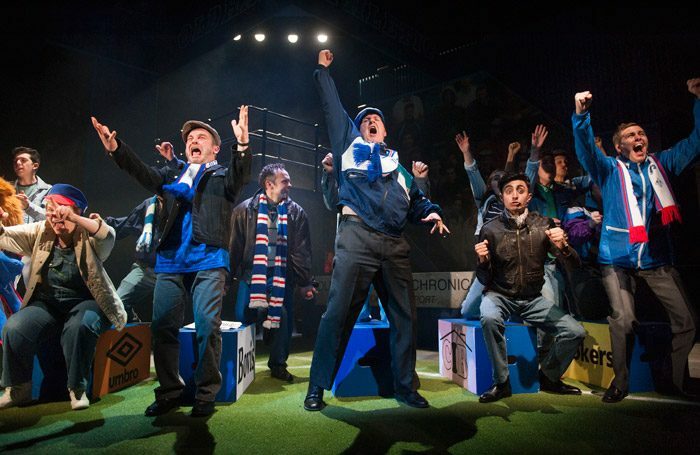 Which is probably why the terrace chants sung by passionate Oldham Athletic supporters in this musical by the same team behind the Coliseum’s previous Oldham-based musical, Dreamers, are premier league material compared with the uninspiring new numbers. Indeed the show, set in 1991 when Oldham Athletic won First Division promotion, might have benefited from relegating these songs and integrating more up-beat anthems into an otherwise compelling social comedy in which a widowed father’s loyalty to the “mighty Latics” is set against accepting his upwardly mobile daughter Mandi’s marriage to football-loathing local Asian businessman. After a faltering start on a set that provides a strong framework for the match-day spirit of Boundary Park stadium and neatly accommodates a three-piece band, the show’s main themes – family values and football culture as a unifying force – eventually serve as a catalyst for community cohesion in Kevin Shaw’s production, but there’s some off-note solo singing, odd lighting cues and offside crowd choreography before full-time. The cast, led by John Elkington as the father learning to put love of daughter and son-in-law before 11 men and a ball, enter into the team spirit, including Jenny Platt’s Mandi bringing female power to the male-owned terrace and Yasmeen Khalaf as a reluctant bridesmaid, although comically gifted Des O’Malley, playing Mandi’s Latics-obsessed brother, is clearly the man of this match.